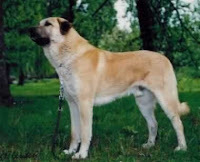 Originating over 6,000 years ago in Turkey, the Anatolian Shepherd were bred to be used as a guardian of both property and livestock. This breed was noted for being able to make independent decisions as well as for their ability to withstand harsh climates, which was necessary for their nomadic way of life. This ancient breed is regarded as the national emblem of Turkey.